Disclaimer: This circuit description is for your information only. Do not attempt to duplicate! Danger! High voltages can kill you! 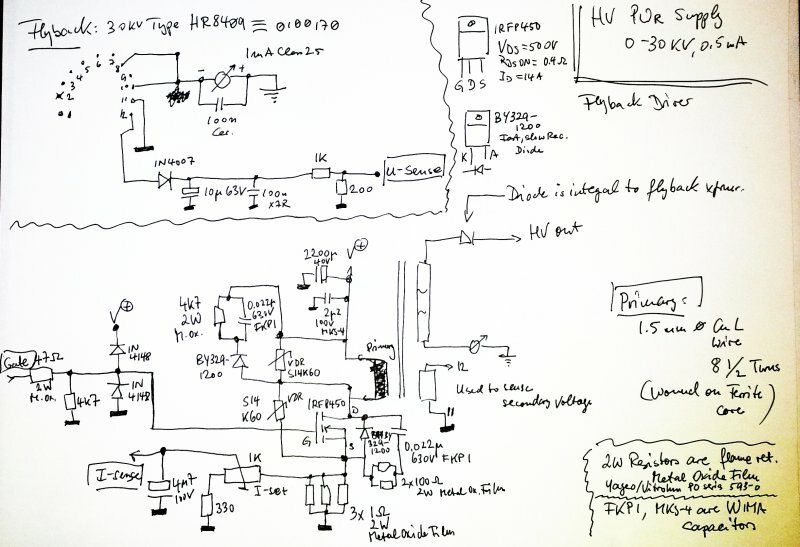 For many purposes, a regulated high voltage supply can be very handy. Purchasing one is not easy because such supplies are in high demand by all hobbyists that love sparks, and used units are quite expensive. Fortunately, high voltage transformers are much more commonly available, from TV sets, so-called “Flyback” transformers. These provide, depending on type, up to 30 kV of DC voltage, at a pretty decent power of about 20-30 Watts. Quite a few circuits are around, to provide drive signals for flybacks. These work, but often only for a short time – after a few sparks, the driver stage transistor blows. And, most of them have no means of adequately controlling the voltage. Control of the high voltage typically requires measurement of the high voltage, a task that is not easily implemented – requiring expensive and bulky divider resistors. The circuit described here is time-proven, and eliminates many of these shortcomings. 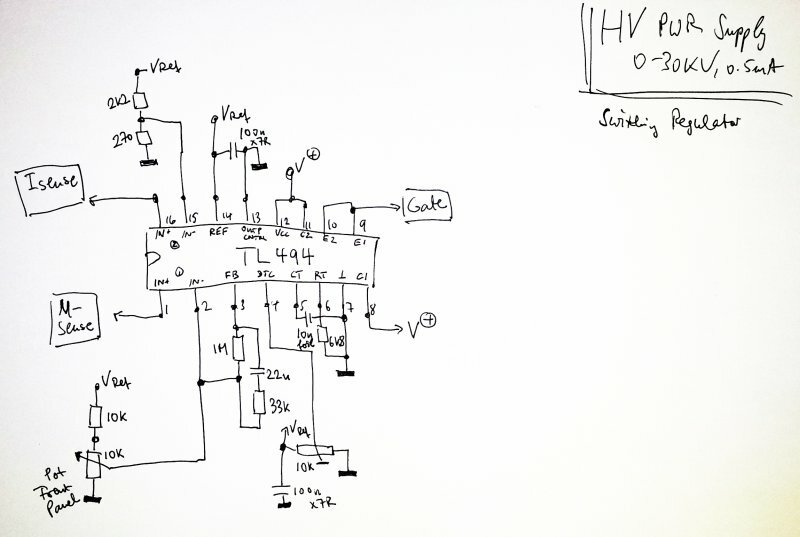 (1) Snubber networks around the coil and switching MOS-FET eliminate spikes in case of a shorted output (sparks act like shorts on the output). (2) The primary winding – it is of very low inductance, just a few turns. This makes it easier to control the voltage spikes on the primary, and allows low voltage drive circuits (much reduced risk of electric shock, much better for amateur use). Still this circuit is dangerous! Do not attempt to replicate! (3) Switchmode regulation with current limit – also this provides added protection against overload. Dead-time control limits the maximum duty cycle (power). The design, all build around a real classic, a TL494 switchmode regulator. Power is supplied via mains filter, and two transformers. 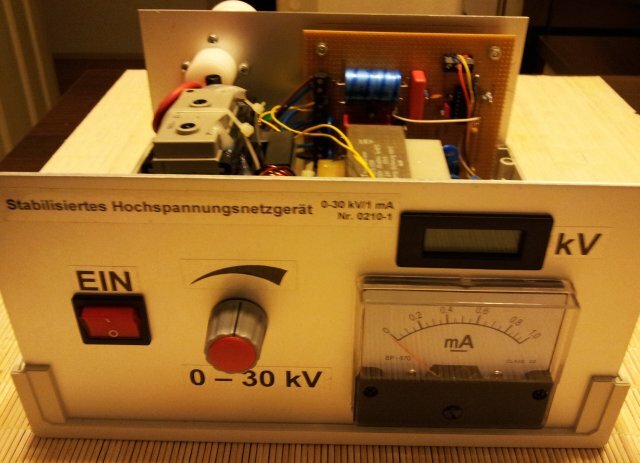 Second transformer is only a needed for the LCD panel meter (Voltage display in kV). Note that the regulator and primary coil is on a floating ground. 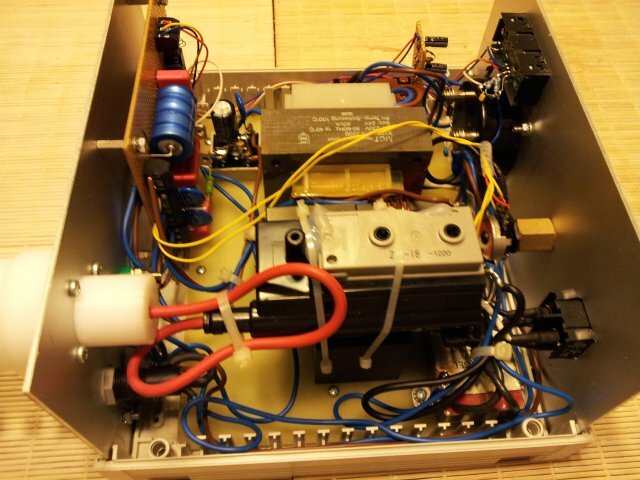 Earth ground is used for the high voltage coil, with a 1 mA full scale amp meter. Actual output current can be above 1 mA, depite the caption “0.5 mA”. 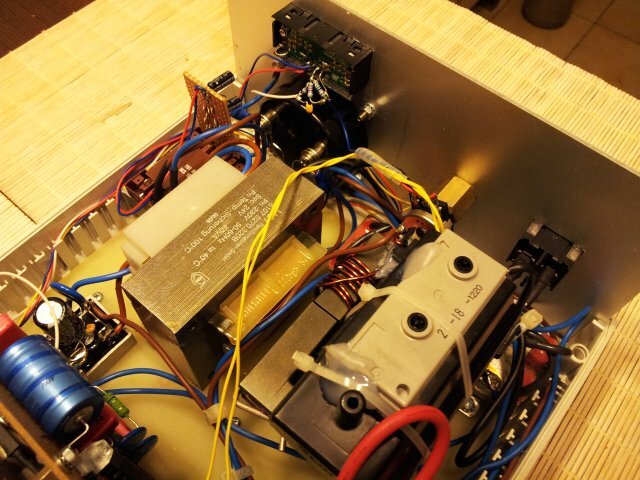 Make sure to adjust the maximum current conservatively, and also the dead time, to keep the output power limited – otherwise, the flyback transformer will suffer and eventually stop working. 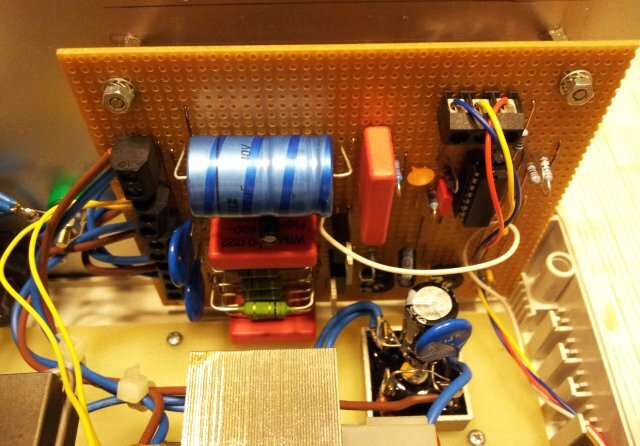 The most interesting part, the flyback driver and snubber circuits. 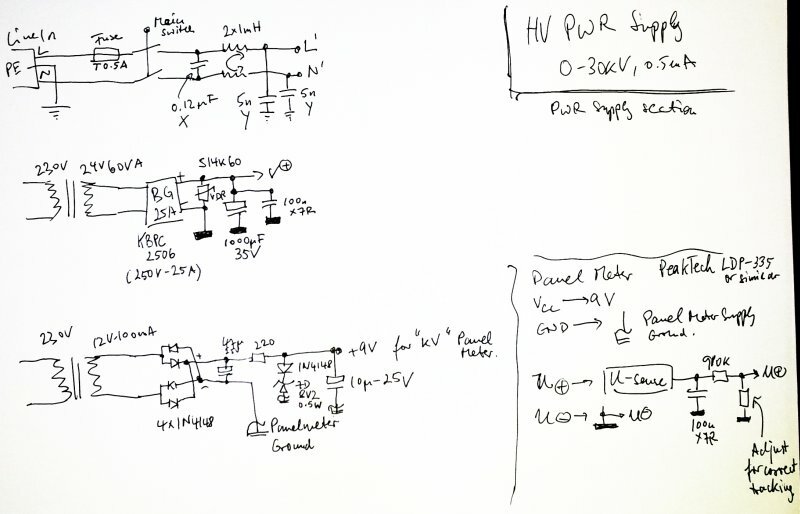 The snubber circuits were designed with a lot of effort, using a scope to probe the overshoot voltages, etc. 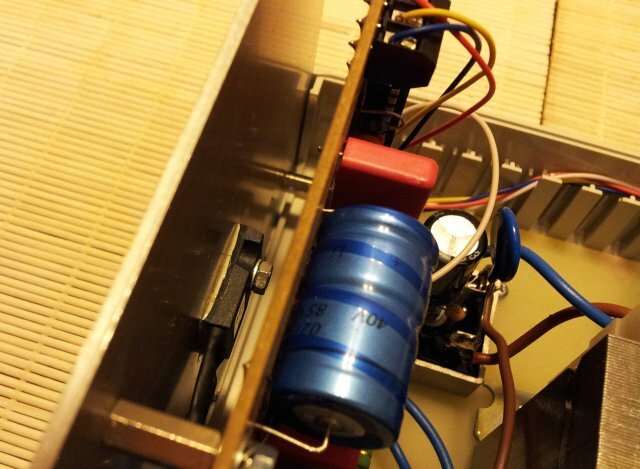 – if you change the flyback or primary inductance, make sure the check proper dampening! The BY329-1200 is a fast diode, with rather slow (soft) recovery. This will lead so some extra power losses, but this can be tolerated here. The VDRs add some more protection, but actually, they were added more for peace-of-mind than for any real purpose. One thing to be improved in further design updates is the gate drive: the gate to source voltage is currently the full voltage of (about 24 Volts), it works, but it is running close to the limit of the IRFP450 device, or even above the limit. Furture circuits will include an independent linear regulator, to run the TL494 from a 15 V supply, derived from the main supply, and maybe a Zener diode added to the gate drive signal path, for added protection agains gate voltage excursions. The IFRP450 is driven rather hard, via a 47 Ohm gate resistor, and has very small switching losses. 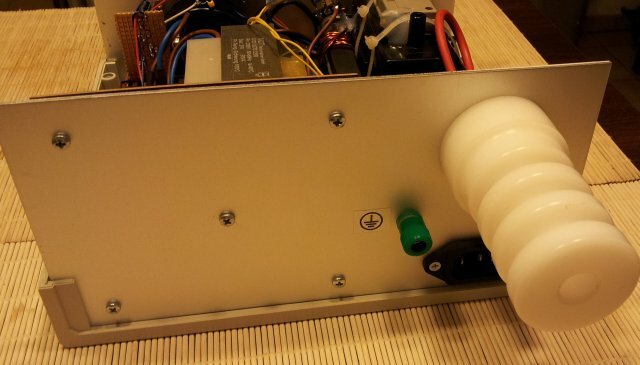 No heatsink required, mounting it to the rear panel will provide ample heat dissipation. The flyback itself, a 0100170 equivalent to HR 8409 type. The only coils used are the secondaries. 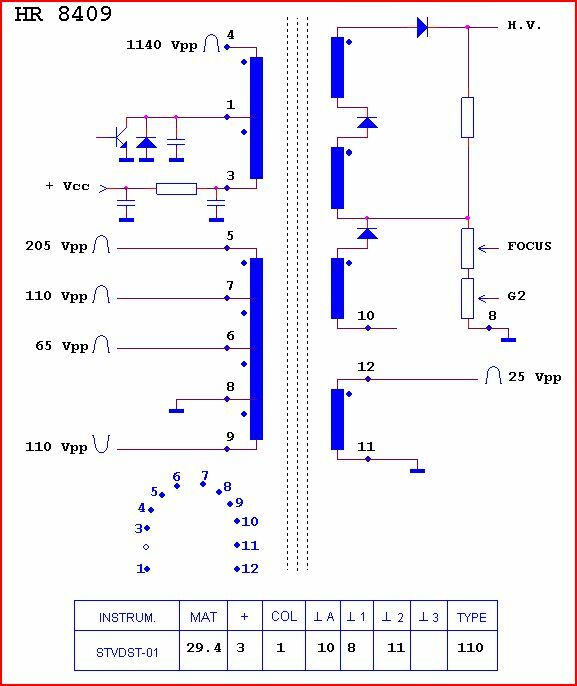 The high voltage coils, for the output, and the 11-12 coil, for the voltage feedback. The voltage derived from this coil by half-wave rectification is a very accurate representation of the high voltage output. This has been checked at multiple voltages and load conditions! The primary winding is 8-1/2 turns of rather heavy copper wire. You can also twist multiple thinner wires, if no thick wire is handy. I used double-isolated type; the device below is just a lab demonstrator for personal use, for professional cirucits, it is suggested to use PTFE (Teflon) or silicon tubing to provide additional isolation of the primary winding from the ferrite core. Keep your fingers (and other wires) off the other primary windings!! These carry dangerously high voltages, at significant power, and might be more dangerous than the acutal high voltage secondary! The rear panel has the high voltage output: a big isolator, machined from HDPE plastics, with a 4 mm receptacle hidden inside.